- Clean chicken and cut into small bite size pieces. - Peel off garlic skin. Clean, pat dry and mince garlic. - Peel off onion skin. Clean, pay dry and cut into 1/2" cubes. - Clean and cut green onions to 1" in length. - Cut dried chili to 1" in length. - In a bowl, mix patoto flour with chicken. - Heat oil in a small pan, fry dried chili until it turns dark red in color. Remove from oil. Set aside. - In the same pan, fry chicken until chicken is cooked. Take care not to burn and overcook. Remove from oil. Set aside. - In a small bowl, add sugar, oyster sauce and Thai light soy sauce. Mix well. - Heat 2 tablespoons of vegetable oil in a pan. On medium-high heat, add minced garlic in the pan. Stir fry until fragrant. - Add onion and fried chili. Stir for about 1 minute. - Add prepared sauce. Stir well for about 1 minute. 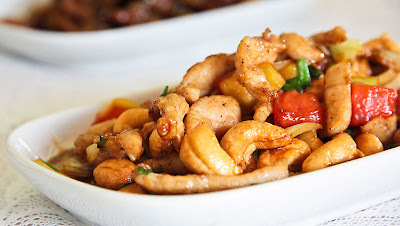 - Add fried chicken and cashew nuts. Stir until the sauce is almost dried up. - Turn off heat. Add green onions. Stir well. Remove from heat.